Look at the birds of the air . . .
And the birds of the air, and they will tell you. . .
As I sit at the table working on my Bible study, my attention is drawn to Pumpkin, an autumn colored canary hen attempting to tear off pieces of thin muslin strands to make a nest. 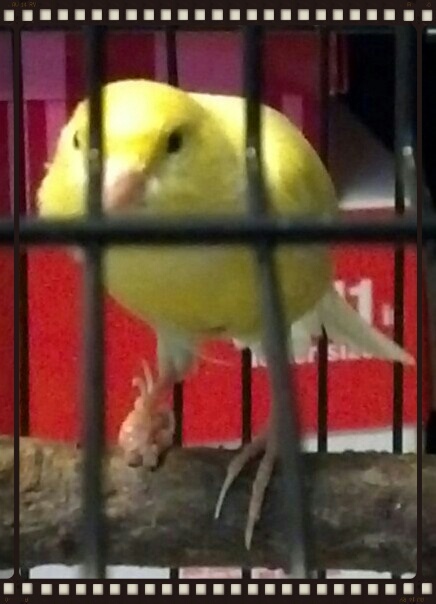 Orsino, a male yellow canary sits on a perch above her, chirping quietly. When she succeeds she sets off for the highest perch. Orsino and Pumpkin belong to my sister and her husband. 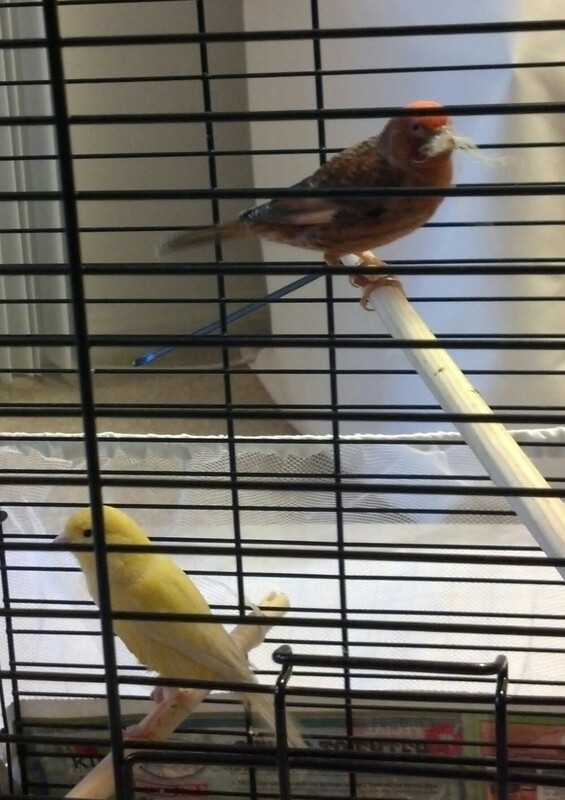 In December they drove from California to Iowa for a job relocation; the birds would have died going from the warm California winter to the bitter cold of Iowa, so yours truly is bird sitting until mid-April. I am allergic to them. When I began cleaning their cage, I noticed that my arms would get itchy; my head hurt, and the bird smell stayed in my throat. 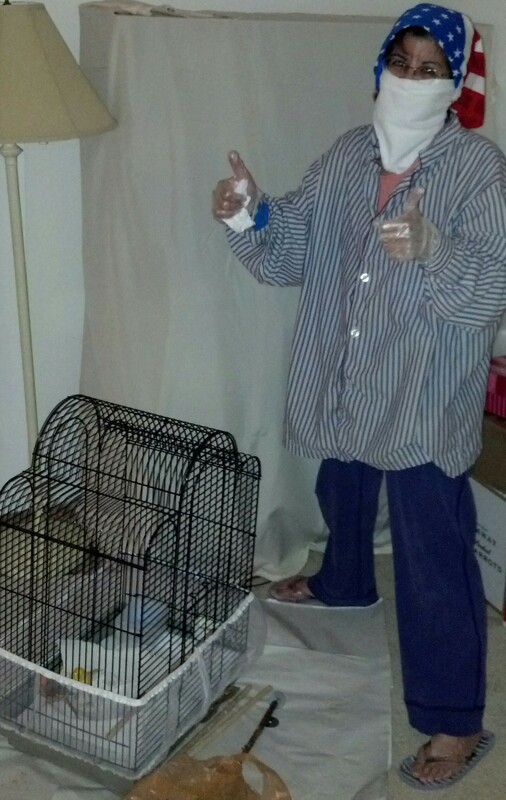 So now, I dress as if I am going into a hazardous area. Changing the cage bottom’s paper has become easier as I have developed a system that facilitates the process. When they bathe, I wrap the cage with newspaper so that the water does not splash onto the carpet and furniture. When the wooden perches get too dirty they are replaced. I threw out the hooked plastic food and water containers and now use soufflé paper cups for their food and plastic scoops for their water; these are held in place with zip ties. Less work, less smell, more sanitary for them (and me). The birds compete for water and food, Pumpkin will go first, but Orsino makes himself bigger, pecks at her, and she backs away. She can be downright mean, though; I have also seen her fly around him and knock him off the perch. Yesterday, she bullied him away from the water. Orsino, you see, has a bum foot. It was injured and the two outer “toes” have curled up, the middle larger one is bent under, but he can still use the back “toe” to hang on to the perch. Orsino and Pumpkin are noisy, especially when they “quarrel” loudly. They are distracting during our homeschooling day. I asked my daughter, “Noah, do you think that when we have strife between us, we sound like noisy quarreling birds to the Lord, just as the birds sound to us?” Ugh. There is no need for strife between mother and daughter — we sound just like the birds when they go at each other. Orsino is an American Singer canary who can belt out a chirping song that begins softly and ends in a loud vibrato. Pumpkin, cheeps and chirps, and does not sing, but her pitch is annoyingly high. They do have quiet moments together, which we truly appreciate. What struck me was that, like us, both beautiful and irritating sounds can come from them. James 3:5 states: In the same way, the tongue is a small thing that makes grand speeches. But a tiny spark can set a great forest on fire. Dear Father, thank you for using Orsino and Pumpkin to teach us lessons about how we live our daily lives. It is true, “Behold, how good and how pleasant it is For brethren to dwell together in unity!” (Psalm 133:1) I am also learning that regardless of what happens in my body, it is still useful. These lessons will remain with us longer than the birds do. Help us, Father, in Jesus’ name, to love each other as You desire, and so show those around us that we are true disciples of Your Son. Amen. This entry was posted in Family, Homeschooling, Jesus, Life and tagged "Look at the birds...", abundant life, Bird watching, Christian Life, God's Purpose, Lessons from birds, Patience, Peace. Bookmark the permalink.